Australia has long produced some great mystery writers: Peter Temple, writing the Jack Irish series about a lawyer and gambler turned PI, as well as a number of standalone crime novels; Kerry Greenwood’s post-World War I series featuring private detective Phryne Fisher, to name just two. But in just the last year, authors from Down Under have delivered two new excellent mystery series. Federal Agent Aaron Falk left his tiny hometown of Kiewarra 20 years ago after the suspicious death of a friend. Now he gets word that another friend from that time, Luke, and Luke’s family have all been killed. Luke’s dad sends Aaron a letter that simply says “Luke lied. You lied. Be at the funeral.” And so he returns home to try to figure out what happened, and to try and come to terms with the death of his friend two decades before. This has a great cast of characters, two interesting mysteries split across 20 years, and Harper writes so realistically of the drought-stricken Outback that you can practically feel the hot wind coming off the sheep farms. A year ago, Sydney detective Ted Conkaffey pulled over on the side of a rural road to adjust his fishing equipment; a girl at the bus stop nearby went missing at nearly the same time, and was found days later assaulted and left for dead. Ted was accused but not convicted of the crime, released from jail with no job, no family or friends, and no prospects. He fled north, to the steamy, swampy, crocodile-infested wetlands of Crimson Lake. At loose ends, struggling for money, his lawyer connects him with private investigator Amanda Pharrell, herself convicted of murder when she was a teenager. Ted and Amanda make uneasy partners, but jump in together on the case of a very successful local author who has gone missing. Fox weaves together an interesting current mystery (is murder-by-crocodile possible? ), while also teasing aspects of Amanda and Ted’s pasts in a way that will leave you impatient for the sequel. Today begins the 2016 Summer Olympic Games in Rio de Janeiro, Brazil. Watching televised coverage of the Games, you will surely see glimpses of life in Rio in the background. If you want to round out your sports viewing with a more robust and nuanced view of life in Rio and in the rest of Brazil, here are some books and authors to pique your interest. (You’ll find even more on this list). Crime: Evil under the Rising Sun. Watching the cherry blossoms burst forth and fade always makes me think of Japan. But my Japan is not a place of samurai, ninja and serene Zen temples. The Japan I think of is lit by neon rather than a rising sun. A place of tailored suits, leather jackets, discos and hostess bars, a place where the eternal human game of life and death, cops and robbers, is played with a unique style. Here are some favorite titles – fiction and non-fiction – about this Japanese underworld (and here they are in our library catalog). Jake Adelstien did not intend to become a crime reporter for Yomiuri Shinbun, one of Japan’s largest newspapers but this was Tokyo in the 90’s and he needed a job. Jake was soon rubbing elbows with police detectives and senior yakuza figures. Adelstein uses his status as an outsider supplemented with sometimes insane courage to take the reader deep inside the Japanese criminal world. 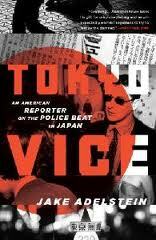 Tokyo Vice, by Jake Adelstein. Another outsider to penetrate the darker places of Japan was British journalist, Richard Lloyd Parry. His investigation following the disappearance of Lucie Blackman while she was working in a hostess bar takes the reader along a convoluted path stretching from London to Tokyo’s Roppongi district, from the oceanside cave where her body was found through the long and complex trial of her accused attacker. People Who Eat Darkness, by Richard Lloyd Perry. Shoko Tendo was born inside this darker world. 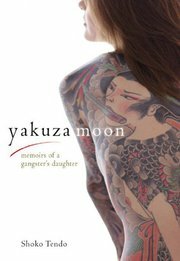 In her revealing and sometimes harrowing memoir she shows us the unadorned life of someone raised inside the yakuza. This is an unblinking look at the rare joys and frequent despairs of a criminal life where women are considered accessories or chattel, if they are considered at all. Ms. Tendo’s path leads through drugs, loan sharks and violence until she creates her own way out and in so doing transforms the traditional yakuza tattoo into a symbol of strength. Yakuza Moon, by Shoko Tendo. Author rablogsplPosted on May 17, 2012 August 4, 2015 Categories BOOKS, LISTS, Mystery and CrimeTags book lists, crime, fiction, international mysteries, Japan, Japanese culture, Jason, mystery and crime, Nonfiction, true crime, Weekly Crime Column2 Comments on Crime: Evil under the Rising Sun. For those of us who love mystery novels, the quest for the next exciting detective or, better yet, the next series, is endlessly diverting. As it happens, this is a wonderful age for us, with the advent of many new absolutely top-notch works and series from abroad, best-sellers in their own countries, being released here in translation from their original languages. Whatever your area of interest, from Amsterdam to Tokyo, there is a novel for you!